Have you ever seen an inspiration photo and just wanted to copy it literally? I couldn't help myself by making this 6 opening frame with my Silhouette and filling each opening with something different from the inspiration photo. White wood grain designer paper, a piece of lace for the wedding dress, Vertigo for the glass frame, circles & dots in pink and purple, roses on a wood table and a sentiment. It was so fun making this card!!!!! 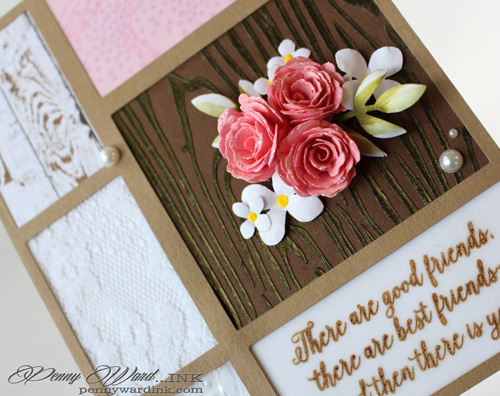 Wood grain under the flowers is stenciled with Creative Medium Bronze. Sentiment is stamped with StazOn onto Vellum. Can I be my own best friend and keep this one?!? Penny this is just gorgeous. Love the panel effect and earthy tones with a touch of pink. WOWEE - this is stunning - took my breath away as I gasped in awe!!! Love the six panels and the way you have just created a work of art, a masterpiece, that YES, you could keep and frame!! 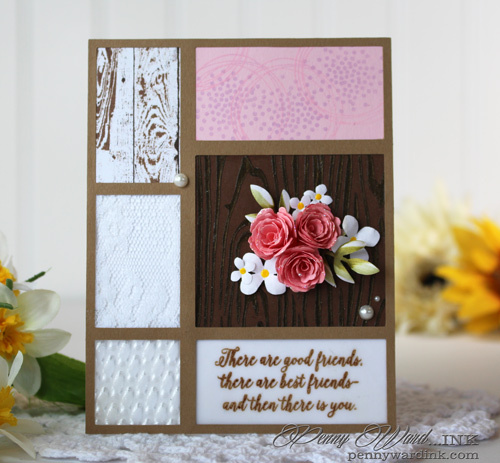 Love that woodgrain square and the sentiment looks like watercolored script - just a fantastically wonderful and sweet card!!! Wow.. What a beautiful interpretation. It's just stunning. Thank you so much for sharing.